Follow the White Bunny: Shop news: free pattern with your purchase! Shop news: free pattern with your purchase! Yay! 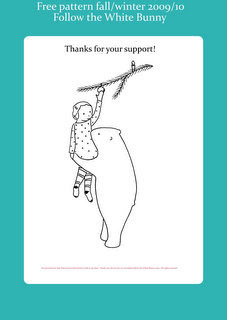 The next couple of weeks (or maybe a bit longer) you get this cute 'bear & girl decorating a tree' pattern when you purchase patterns in my shop. What a great deal. And the freebie is adorable. Just put a link to this post on my blog. I hope it brings you a few extra sales or, at least, new fans. super duper cute. i'll definitely have to make a purchase as that darling girl and bear must become a christmas ornament to hang on our tree! :D It would be a huge ornament if you would use the original size though! Such a sweet sweet freebie!